All my shows are coming back!! SWEET! I used to hate fall, when I was in school. It meant that I had to go BACK to school, which I wasn’t interested in doing. It also meant winter was on the way, and I hate the cold. But now I LOVE the fall because it means that my TV shows are coming back! With a vengeance! So far, Biggest Loser, Project Runway, Top Chef, Greek, House & The Office have started. Looking forward to SVU tonight, CSI soon & Amazing Race on Sunday! I know, I probably watch too much tv. Oh well! I did want to note that I’ve probably been watching too much Special Ops Mission when in Target, maneuvering through crazy racks, I told Ella to “watch my six”. Don’t think she picked up on it. Also, HAPPY BIRTHDAY GRANDMA/GREAT GRANDMA! My lovely grandma is 75 today! Love her & hope she has a great day! Only 1 more week til we are in Disney World riding Dumbo, hugging Mickey & obsessing about princesses & fairies! Can’t wait! 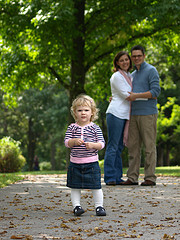 I’m putting up a few more of our family pictures from our photo shoot with Sara over Labor Day weekend. It’s really exciting to finally have pictures of my little family! Ella passed her Parents as Teachers evaluation with flying colors! Her PAT lady (is that what I should call her?) even said she probably would have passed everything on the 27 month evaluation. She’s such a chatterbox…her vocabulary is huge. Ella is using the potty a couple of times a day! Nothing really consistent yet, but it’s a start! I love stickers…such a great reward/bribe! We have a busy few weekends ahead of us, but we are looking forward to everything. Also, only 12 more days until Disney World! Hooray! -Do you remember when you were a kid, playing Nintendo (or Atari) and it wouldn’t work? You take the cartridge out, blow in it and that would magically fix the problem. Every kid in America did that, but how did we all know how to fix the problem? There was no internet or message boards or FAQ’s. We just figured it out. Today’s kids are soft. - I think part of a best friend’s job should be to immediately clear your computer history if you die. - LOL has gone from meaning, “laugh out loud” to “I have nothing else to say”. - Whenever someone says “I’m not book smart, but I’m street smart”, all I hear is “I’m not real smart, but I’m imaginary smart”. - How many times is it appropriate to say “What?” before you just nod and smile because you still didn’t hear what they said? - I love the sense of camaraderie when an entire line of cars teams up to prevent a —- from cutting in at the front. Stay strong, brothers! - While driving yesterday I saw a banana peel in the road and instinctively swerved to avoid it…thanks Mario Kart. - “Do not machine wash or tumble dry” means I will never wash this ever. Of course, not all of them are as funny as others. But I especially appreciate the ones about Mapquest (Yes, I know how to get out of my neighborhood! ), Nickelback (UGH!) & iTunes. I totally do that. 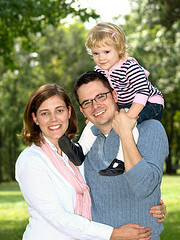 This past weekend we had some family pictures taken by our friend Sara. These were the first official, formal family pictures we’ve had taken. I know that is sad, but at least they turned out really cute! We took the pictures at Laumeier Sculpture Park. Even though we didn’t utilize the art in the park, it was a great place to take the pictures. Working with a 2 year old is not particularly easy, so a big thanks to Sara & Jared for making it work! As the pictures get edited, I will share some more. Thanks again to Sara (& Jared) for taking the pictures & letting me put them on my blog! 2. Dave & I had the pleasant privilege of waking up pre-5 am today to Ella screaming for Elmo. Lovely. He was in her bed, right next to her, but I guess she couldn’t find him. Either way, it ended in everyone being up around 530. Hopefully that doesn’t mean we have an awful day. It’s looking okay so far, but you never know what will happen in a couple of hours when Ella gets tired again. 3. Our house has a fantastic new price! If you know of anyone that is looking for a first house or a smaller house in which to retire, please send them our way. Thank you! Only 18 more days til Disney World! Woooooo!!! Ella turned 2 & had a great party: CHECK! Still training for 5K: CHECK! (This is going surprisingly well considering I have good weeks & bad weeks). Traveled to Lake of the Ozarks (Ella & me): CHECK! We have had a crazy busy summer (I’m sure everyone has because the weather has been AMAZING!). I have pictures of plenty of these fun activities & events, but I don’t have them all in one place right now. I will put together some of them and put them up soon. Since I last posted about inconsiderate people driving through the neighborhood, there has been very little, if any, street racing or loud cars in the middle of the night! (Or at all…though I don’t think they’d do it during the day, anyway). Sweet! They must have read my post & decided they were being idiots. Dave & Sara have been taking pictures at several weddings this summer! Their pictures are awesome (check out flickr!) & they keep getting better & more efficient. I’m excited to get our family pictures taken by Sara this weekend! Today (yes, just this morning) Ella had a new skill explosion. She learned to take off & put on her clothes. Which she did. Repeatedly. Great job, baby! But please save that skill for home & not for public viewing. We don’t need family services hunting us down or anything. Also, as you probably know from my facebook, Ella has gotten up WAY TOO EARLY the past couple of days. This is most likely due to Dave showering for work. (So really, there’s not much we can do about it. Unless Dave goes to work stinky). Her lack of sleep has lead to a very crabby toddler the rest of the day. (And by crabby, I mean she pretty much won’t do anything without screaming, crying and/or whining. Yeah.) This has forced me to put her back into bed a couple of times. Well, this morning, about 14 seconds after I put her in bed & shut the door, I heard a thump. And then…Ella walks out of her room. WHAT??? Yes, she jumped or climbed or threw herself out of her crib. No, she wasn’t hurt (I checked). She actually stopped crying, so I let her stay up & eat her breakfast. But I fear the nights we are now facing if Ella doesn’t want to go to bed at bedtime. We have also discovered this summer that Ella loves both the Cardinals (takes after her Momma!) & classical music. She PREFERS to have “violins” on the radio both in the car & when she goes to sleep (if the Cards aren’t playing). It is funny to hear your child say words that you didn’t know they knew. For example: Grasshopper. What? How do you know the word grasshopper? I know that Ella repeats & copies EVERYTHING. Seriously. EVERYTHING. But I don’t know where she learned “grasshopper”. Maybe Sesame Street? She probably reads the dictionary while I’m not looking. She’s also learned most of her colors, with the exception of red. She calls red “green”. She calls green “green” also, so I don’t know what that’s all about. She can identify orange & pink, so I’m not sure if she’s color blind or just has a thing for green. (Grasshoppers??) Ella has learned several shapes & can count to 15 or so. She often skips 8. Probably because 7 is a monster. (Monster! Another word that came from…????) Ella loves to sing with us now. Her favorites are Twinkle Twinkle, the ABCs, Take Me Out to the Ballgame & The Itsy Bitsy Spider. Many times, I will catch her singing something to herself or one of her toys (which she puts in “time out”…hilarious). Ella can do a forward roll all by herself. She is getting closer to wanting to use the potty. 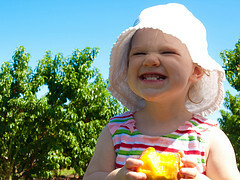 She has an amazing palate for a 2 year old…she loves pickles, olives, anything sweet, pepperoni, queso dip, salsa, etc. I never know what each day will bring, but I STILL think that staying home with Ella Kate is the best, most amazing job I’ve ever had. Now that September is upon us, we have a lot to look forward to in the fall! Our trip to Disney World is very soon (HOORAY!). We have lots of sports to watch cousins play. There will be band competitions to go to, pumpkin picking, bike riding, and lots I can’t think of now. Hopefully our house will sell & we can start to actively search for our new house! I hope that your summer has been as fun-filled as ours and that your fall will bring lots of happy memories.